Well, the easy way to finish that thought is “a thousand words.” I’ve often wondered just how true that is. After my latest entry in my “Woolmarket” series, I became quite nostalgic. So I pulled out some old family albums. I began looking at some family photos of yesteryear…of relatives long since deceased. I came across several pictures of my favorite uncle who died of a heart attack at just 42 years of age. He was more like a brother to me than an uncle. Jerry was as big an Alabama Crimson Tide fan as you would ever meet. He never darkened a classroom at UA. But, no one was as fiercely loyal as he. Uncle Jerry and I enjoyed many a day during football season. I still follow football, college football, specifically. But, it’s just not the same without him. There were photos of great-aunts and uncles who I never knew or scarcely remember now. I saw a photo of me as a five year old sitting on my grandpa’s knee with my grandpa holding his shotgun up after a day of quail hunting. That shotgun sits quietly in my hall closet now. For some reason, I have just noticed he looked sad in this picture. I’m not sure why. I saw some photos of my little sister who was killed in an accident at home. I dearly loved her…and always will. Even my mother’s death from cancer didn’t hurt me as bad as my little sister’s death. She had only been married six months. She had just started to live. 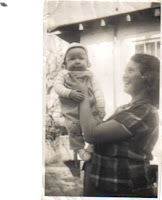 But, out of all the photos I looked at yesterday, the one of my mother holding a 5 month old fat baby boy named David is the one that struck me most. She seemed so happy in that picture. Even though it was a black and white photo, you could see the sparkle and pride in her eyes as she held me up to the camera. For once, I wasn’t crying when my picture was taken. Mama was so young in that pic. In fact, she was only 19 when she gave birth to me. As proud as she seemed to be in that picture, I’m probably just as proud or moreso of her. “She asked so little, but gave so much.” I think that’s the best way to end this little entry today. viewing of the "albums" (tasting our works) leads to the discovery of love and true meaning. Tomas, viewing old family pics is like taking a time machine back to a day you remember so vaguely. Yet, it is so fresh in your mind as well. Difficult to explain. xomba, it's deja vu all over again, isn't it? hehe...I think I know what you mean.